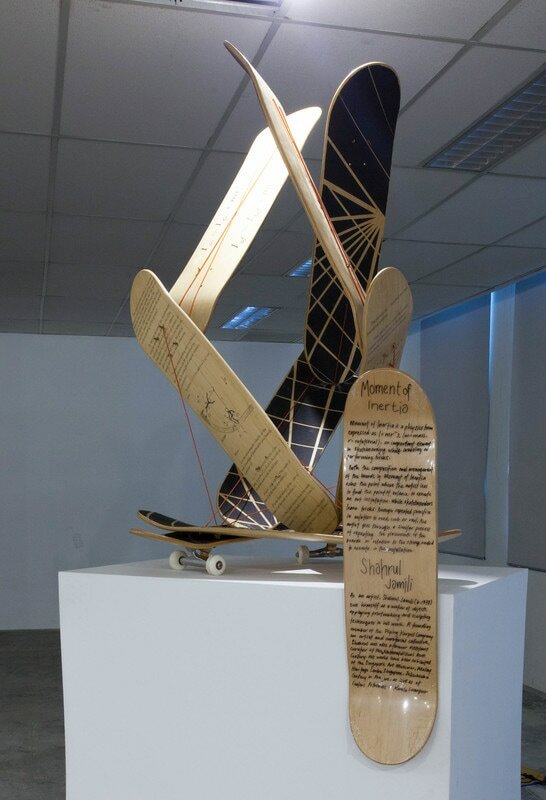 ​This art installation celebrates the relationship of skateboards and physics. Since skateboarding is an act that involves movements, force, frictions and rotations. Within time and space; it could easily become a case study in applied physics. Moment of inertia is a physics term to explain the inertia for rotation where the point in an object remains in its place when the object is rotating. It is expressed as (m = mass, r = rotational). The moment of inertia is actually an important element in skateboarding while cruising or performing tricks. Moment of Inertia is a representation of this element in skateboarding in the form of art installation. The composition and arrangements of the boards are in accordance with the moment of inertia, where the artist has to find the point of balance to enact such art installation. While skateboarders in search of achieving successful tricks requires repeating actions and practices, until they find the correct balance point and the skateboard in relation to the surface where the tricks are performed; the artist on the other hand went through a similar process of repeating the placements of the boards in order to find the point of balance of the boards in relation to the correct length of strings to keep the boards to stay in place. 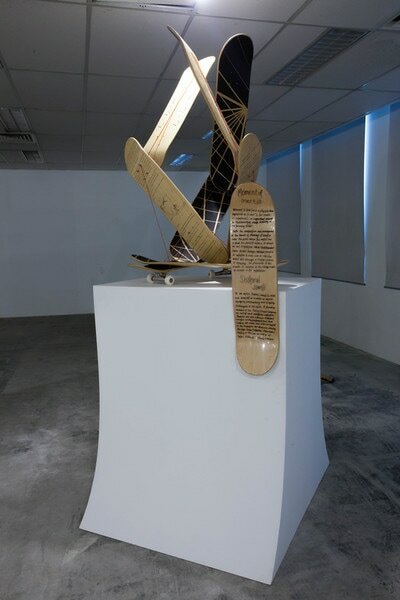 These two practices involve calculated activities, for the skateboarding involves distance of space and time while the art installation involves distance and tensioning of the strings which determines by the length of the boards. The technique applied in this art installation is called tensegrity, established by Buckminster Fuller, a system theorist who figured out a way to erect a structure by using struts tied together with tensioned strings. In relation to the surface of the boards in this art installation, the grids created from the composition of sand paper on the top surfaces of the boards is forming a spherical coordinate while the mathematical / physics expressions on the bottom surfaces explained the skateboard - skateboarders relationship while in motion. Shahrul Jamili (b. 1978) sees himself as a maker of objects, applying printmaking and sculpting techniques in his work. A founding member of the Flying Karpet Company – an artist and curatorial collective, Shahrul was also a former assistant curator at the National Visual Arts Gallery. His works have been exhibited at the Singapore Art Museum, Malay Heritage Centre, Singapore, Jakubska Gallery in Prague, as well as at Galeri Petronas in Kuala Lumpur.